This Red Mason Jar Hummingbird Feeder is a large capacity hummingbird feeder, with a nice colored reservoir ideal for large flock of hummingbirds. It can be heavy and it can leek if not installed the right way, so when you install it don’t tip it to bring leeks to minimum, as it can attract insects. The good thing is high capacity, so you will easily attract large number o hummingbirds to the feeder. The base is made of metal, so it can change over time if nectar leeks on the base, so it is good to clean it on regular basis. This good looking jar is also practical, the 32- ounce capacity is large enough to feed lots of humming birds without daily refills. The perches on the base give lots of place for the birds to rest, and alternate at feeding. The bottle is made with a large opening for easy cleaning and refill , it is easy to screw to the metal base, but must be done the right way to minimize leeks. The small brush is going to be necessary to glean the small joints, and corners. This feeder is not made of plastic, if you live in area like desert, or where ever temperatures rise high in summer, it will not melt. Some plastic feeders on the market can melt if exposed to direct sun over longer period of time. This one is made of glass and metal so this will not happen, but place the feeder in a shade as metal can get to hot for the birds. I think this the metal is a welcome addition, but this hummingbird feeder is best hand washed, if you wash it in the dishwasher the color can get damages or change. To prevent this from happening hand wash it only, that is my recommendation. The feeder is coming with a metal hook, that is used to hang it, but leeks can happen if it is tilted , so hang it on a place without strong winds. It is recommended to hang the feeder in a shaded area, as the metal base can overheat , the birds don’t like to much heat. And the nectar can get fermented faster on direct sun, changing the nectar on regular basis will minimize this issue. There are several types of insects that are attracted to hummingbird feeders, bees, wasps, and ants, but we can do some preventive measures to stop them. By using several methods, we can minimize insects coming to the feeder. Some designs have ants moats or bees guards that are made to prevent insects from accessing the nectar, but the birds can with their long tongues. Moving the feeder can help, insects will have trouble finding it again, but hummingbirds will find it if you move it a few feet. Keep the feeder clean, when birds feed drops can fall around the feeder, and when you refill it clean it from the spilled nectar. Hang the feeder with a fishing line, ants will have difficulty to climb it, bees like sunny spots, so put a cup of sugar water directly on the sun, and the bees will go there, hummingbirds like the shade so put the feeder away from the sun. Use olive oil on the hook where the feeder is hanging, ants don’t like it, but don’t do it I a way where birds can get them self sticky. Like all backyard birds, hummingbirds are wild animals with basic needs. Birders who understand how to attract hummingbirds by satisfying those needs can be rewarded with dozens of beautiful hummingbirds in their backyard. 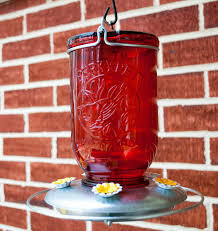 This Red Mason Jar will become hummingbirds hot spot in no time, properly used, and cleaned this feeder will last for a long time, and give you lots of fun, watching little hummingbirds fly and perch on it. I am also including this review about humming bird swing, personally I don’t own one, but lots of time when I go on amazon to buy things, I see this swing on the best seller list. So I did some research, and its time to make a review of this little popular swing. The name is Songbird Essentials Copper Hummingbird Swing , Manufactured by Songbird Essentials Made in the USA, the swing is made of copper, 5-1/2 x 1/4 x 7 inches tall, it is made with a perch for hummingbirds to sit and rest. Hummingbirds are territorial and will try to push each other from the feeding station, this swing gives them a perfect place to rest, and give each other rest, so they can all feed on the feeder. Swing is equipped with a red bead dangler that is made to attract hummingbirds, because they like red, but I think that is not so important, they will use it anyway to rest. Flapping little wings is hard work (about 80 times per second). Packaging includes step by step instructions for hanging the swing. 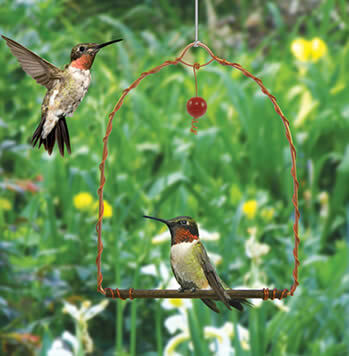 All you need to do is place the swing near a feeder or nectar-rich flowering plant and hummingbirds will use the swing as a territorial perch to watch over their food source. If you have more than one feeder, place the swing in the middle of them, so the birds can alternate sitting on it. Hummingbirds primarily eat flower nectar, tree sap, insects and pollen, so the swing can be placed near some of the food source if you dont have a feeder. Habitat loss and destruction are the hummingbird’s main threats. As hummingbirds are often specially adapted to each unique habitat, each species of hummingbird currently listed as vulnerable or endangered are all threatened due to habitat destruction and loss. Be good to your little hummingbird friends, and provide them with a safe place to feed and rest. Check Perky-Pet 786 Red Mason Jar Glass Hummingbird Feeder here.